President Barack Obama's national security flops just keep coming A strange obsession with setting out his national security agenda is backfiring for President Barack Obama The litany of phantom red lines has caught up with him as he lurches from one foreign policy to the next while reinforcing the Democrats' reputation for weakness. How does comprehensive immigration reform cure this problem? I don't think it deals with it, but it likely encourages more to come. Obama's prisoner swap broke the law? But not all the reaction was so sanguine. Goldman Sachs' Jan Hatzius noted that real gross domestic income fell 2.3 percent in the quarter, the worst performance since the recession. And even if the inventory drag reverses, earlier more rosy estimates for 2014 growth may soon have to be revised down. "It is not certain, though, that Q2 growth will make up all the lost ground, not least because the severe weather has already left its mark on the April data," Pantheon Macroeconomics' Ian Shepherdson wrote in a client note. "We assume second quarter growth will rebound to about 3 percent, but that will leave the average for the first half of the year at just 1 percent. As a result, the Fed's forecasts for growth this year will have to be revised down substantially." MEMOIR FACT CHECK Hillary's Benghazi chapter at odds with factual record Her story is not consistent with the testimony from CIA leaders. In fact it still makes no sense and it appears to be a failed attempt to shut off debate and criticism. Liberals have been piling on Rep. Lamar Smith and his fellow House Republicans for failing to hold more committee hearings on climate change, but Thursday’s often-heated testimony probably wasn’t what the movement had in mind. The House Science, Space and Technology Committee heard from scientists who poked holes in the prevailing catastrophic theory of man-made climate change and said researchers are under pressure to support more alarming scenarios. “The science is not settled, no,” said Roger Pielke Sr., professor emeritus in meteorology at Colorado State University. For President Obama, who came to office hoping to restore public faith in government as a force for good in society, the situation at the Department of Veterans Affairs threatens to undercut his reputation for effectiveness. It is just one of many failures that suggest his reputation for effectiveness was vastly overrated. The Benghazi fiasco stands out as does his recent trip to Afghanistan he is having trouble even giving a coherent speech about his foreign policy. Competence does not appear to be his forte. He is a poor manager, a poor negotiator and generally a poor leader. But, hey, he's cool. In March, a federal judge in New York ruled that the 20-year-long legal campaign against Chevron (CVX) over oil pollution in Ecuador was actually a bribe-fueled fraud. This week in Texas, anti-Chevron activists recruited phony paid protesters to picket the company’s annual shareholder meeting. Some people apparently don’t learn from experience. A Cheniere Energy subsidiary has agreed to a 20-year deal worth $5.6 billion to supply liquefied natural gas to Spanish power and generation company Iberdola, S.A., the companies announced Friday. Iberdola agreed to purchase 400,000 metric tons annually from Cheniere’s planned Corpus Christi facility once its liquefaction Train 1 comes online. That rate doubles once the facility’s Train 2 come online. The facility is slated to have a total of three trains. Once completed, Iberdrola’s commitment would equal about 6 percent of the facility’s capacity. Iberdola officials said it would use the natural gas to supply its markets in the UK and Spain. ... When the facility comes on line it should perk up the market for natural gas in the Eagle Ford. It is just the start of the potential trade deals the US can get if it gets into the export market. For more than a decade there have been sightings of unusual high-speed watercraft patrolling up and down the Columbia River between Portland, Oregon and Vancouver in Canada. The vessels belong to the Navy SEALs and are part of an ongoing project called Sealion, which stands for SEAL (Sea Air Land Commandos) Insertion, Observation and Neutralization. Sealion is an experiment between the US Navy's Surface Warfare Command and the Naval Special Warfare Command. Launched in 2000, the brief was to develop a high-speed, low observable/low radar signature craft that could operate in the littorals i.e. the part of sea close to shore. The House of Representatives passed an amendment Thursday to stop all federal funding to be used for the Department of Justice’s Operation Choke Point, an anti-fraud operation that was found to be cutting off legitimate businesses from their banking lines. This program was designed so that it denied its targets due process of law by cutting off their lawful banking transactions. It involves a shameful abuse of power, by an administration that did not like their business. 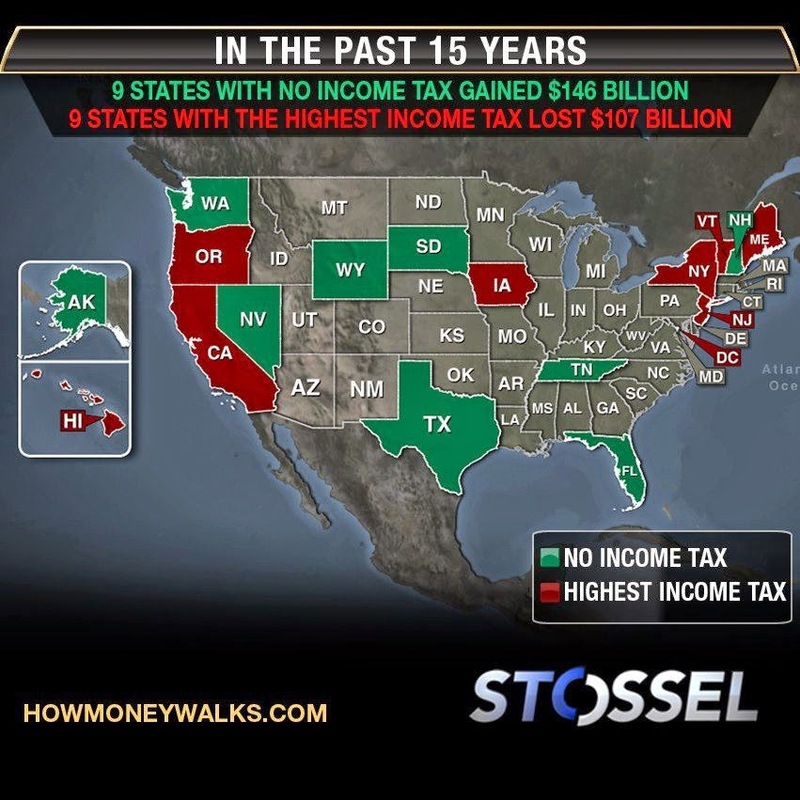 IJReview says, "The states with the highest income taxes have had a net loss in taxpayer AGI of $107 billion, and the the states with no income tax have had a net gain of $146 billion. In other words, there’s been an exodus from high tax states to those with no taxes. The ultimate voting right: with one’s feet." It is one of the reasons so many are coming to Texas. Republican candidates could find themselves under pressure to explain their past votes against proposals for more money for veterans programs. Spending went up dramatically for the VA. It was not so much a shortage of funds as poor management that was the problem. If they needed more money they could have kept good records and demanded accountability they could have made the case for more money. The rapid development of the Eagle Ford shale formation in South Texas is leading not just to a huge oil boom, but also to a boost for drug gangs in the area, according to federal officials. Customs and border protection agents told the National Journal that the vast array of new infrastructure in the area means drug cartels have a web of new smuggling routes open to them. On top of that, gangs have the perfect cover, often stealing trucks bearing company logos so they can pose as workers and smuggle in drugs including marijuana, heroin and cocaine. Some also engage in human trafficking. "(The situation) is definitely being taken advantage of by the cartels in Mexico," Charles Goslin, a retired CIA officer now with security firm Butchko, told the Houston Chronicle. "The Zetas control the (route) that comes up through Nuevo Laredo, it gives them access to the I-35 artery and on to the big retail markets in Chicago." National Review’s Jim Geraghty referred to an incident from the 2008 election in which Clinton walked back a description of landing in Bosnia under sniper fire in the 1990s. Shinseki resigns as VA secretary It seemed inevitable for weeks and has finally happened. But it will take more than removing just a few people to change the culture of deceit at this agency. In the meantime we should be giving veterans vouchers so they can get the treatment that need in a reasonable time frame. It is an interesting presentation. I hope it works. We need this craft now so we no longer have to hitch hike on Russian craft. The LA Times discusses the presentation here. Hey Snowden, where are your copies of the emails raising questions about NSA? Officials say the then-contractor never raised concerns about surveillance, but in a response to The Post, he calls their leak “tailored” to mislead. The guy who had copies of all those NSA documents can't produce copies of his own emails supporting his claim? If they actually existed wouldn't the NSA not deny their existence at this point? His story is questionable at this point. A crackdown along the United States-Mexico border has led drug smugglers to move merchandise through Puerto Rico. These drugs are coming from transit points within Venezuela. With an adequate force to space ratio the US should be able to stop the use of Puerto Rico as a transit point for illegal drugs. They have to come by either boats or planes or both and an inspection regime should be able to stop the traffic. The question may be whether this administration has the management skills to run an effective interdiction campaign. President Obama recently told Democratic donors in ritzy Potomac, Md., that he wants “an effective, serious, patriotic, capable, sober-minded Republican Party.” This line has become part of his regular stump speech to liberal audiences. While such snide condescension towards opponents is nothing new, the president clearly is struggling with the meaning of some basic concepts in the English language. Given his six-year record of mismanagement, there are two wordsObama should avoid using at all costs -- “effective” and “capable.” The failed launch of theObamacare website and the Benghazi security breakdown that got a U.S. ambassador and three other brave Americans killed showed the world how inept Obama's team is at handling routine government functions. The developing Veterans Affairs scandal revealed that vets have been dying due to treatment delays and bureaucrats have been destroying evidence to cover it up. It’s time for Republicans to unite behind one common theme – preventing a new wave of illegal immigration. Reasonable people can disagree about what to do with those who remain here illegally after we reinstate our laws and stop the new flow of illegal immigration. We can certainly debate the level and type of legal immigration we desire to promote in the coming years. But any Republican who shares a modicum of Republican values should put aside those ideas and stop giving aid and comfort to the President by helping him provoke a new wave of illegal immigration. The notion that we must debate about the future of those already here while those very debates are fostering a gushing flow of illegal migration, particularly from Central America, is absurd and dangerous. It is analogous to a homeowner mulishly focusing on what to do with the water in his basement while ignoring the torrent of water seeping under the door. With North American energy markets becoming increasingly intertwined, the U.S. needs to revamp the way it scrutinizes power lines and pipelines crossing into Canada and Mexico, U.S. Rep. Gene Green of Houston said Thursday. The current process — built up through a series of presidential orders dating back to the 1950s — is unwieldy and inefficient, leading to long delays in scrutinizing even modest applications involving existing pipelines, Green said. At the same time, trucks and trains face few impediments to carrying energy supplies across U.S. borders into Canada and Mexico, he said. Green said pipelines’ efficiency extends to their lower cost over railing crude and their relative safety. The Obama administration on Thursday proposed dramatically changing the way it is reviewing applications to widely export natural gas, with a plan that effectively moves more commercially advanced projects to the front of the line. The newly proposed procedure, announced by Assistant Energy Secretary Christopher Smith in a blog post, would replace a two-year-old process that has been widely criticized. Energy companies and their allies on Capitol Hill have complained the existing procedure is akin to a “deli counter” approach that rewards export projects for getting in line quickly at the expense of facilities more likely to break ground. A man shot and killed a suspected armed robber Thursday during a gun battle in a northeast Harris County shopping center parking lot. The 28-year-old man, a former Marine, was eating lunch about 12:30 p.m. when he saw two suspicious men outside a Game Stop store along Wallisville near the East Sam Houston Tollway, authorities said. "He saw them get out of their car and slip bandanas over their faces," said Deputy Thomas Gilliland with the Harris County Sheriff's Office. The veteran, who has not been identified, saw the men open the trunk of their car then dash inside the store. Minutes later, one ran out carrying several video game systems in his arms. The other suspected robber remained in the store and was demanding cash from customers, deputies said. The veteran, who has a concealed handgun license, went to his pickup truck and pulled out a semi-automatic pistol then told a bystander to call 911, deputies said. When Bushies blew a CIA cover, it was ‘treason’; now, it's a mistake That is the way liberals roll. Operation Choke Point, a credit card fraud task force run by the Justice Department, was created to “choke out” businesses the Obama administration finds objectionable, according to a congressional committee report obtained by The Washington Times. The administration is knowingly targeting so-called “high risk” businesses — which include payday lenders, gun retailers and ammunition merchants — despite the fact they are legitimate, says a staff report by the House Committee on Oversight and Government Reform. Internal documents within the Justice Department acknowledge the program’s impact on legitimate merchants, the report says. Attorney General Eric Holder was informed that banks were exiting entire lines of business deemed “high risk” by the government, yet his agency continued to pursue the operation. Sen. Harry Reid’s attacks on the billionaire Koch brothers are having an unforeseen impact — spurring other wealthy GOP donors to give to groups that keep supporters’ names secret. If Democrats want more disclosure they are going to have to outlaw the stalking of opposition donors. As long as they think it is OK to attack those who donate to their opponents, they will find donors more likely to find ways to do it that don't require disclosure. European Commission proposes plan to cut foreign energy reliance The European Commission has proposed a plan to cut the EU's reliance on foreign energy, particularly from Russia. The strategy follows Moscow's threats to halt gas supplies to Ukraine, a key transit point for Europe. Don't hold your breath waiting for them to start fracking and producing their own natural gas. They also need to focus on alternative suppliers like the US and Israel. Obama economy in the tank? U.S. Economy Shrank at 1 Percent Rate in Q1 Liberalism is not working and neither are a lot of people. The president's West Point speech was short on policy but big on grandiose platitudes and self-congratulatory statements that will do nothing to reassure America's allies in Europe, Asia and the Middle East. It was a distinctly lightweight address on issues of tremendous gravity, with a direct impact on U.S. interests. From Tokyo to London, America's partners are looking to Washington for leadership, but getting feel-good Twitter sound bites instead. I find him easy to tune out these days. Gardiner was not the only one unimpressed with this effort and even the audience of cadets mostly sat on their hands. The speech was loaded with the usual Obama straw men and false choices. In some cases, Homeland Security officials are sending the children to be with their parents — even when those parents are known to be living in the U.S. illegally. A federal judge in Texas blasted the department for that practice late last year, saying the government essentially had become complicit in criminal activity. “The DHS is rewarding criminal conduct instead of enforcing the current laws. More troubling, the DHS is encouraging parents to seriously jeopardize the safety of their children,” Judge Andrew S. Hanen wrote in a court order. ... The reforms the Democrats are pushing will not solve this problem and Obama's policies only encourage to more kids to come. Wallace Hall is a University of Texas Regent appointed by Gov. Rick Perry. He is presently facing impeachment and possible jail time for uncovering what looks and smells like systematic corruption in the enrollment process of the University of Texas system due to interference from members of the Texas legislature. The Speaker of the Texas House is implicated. The Chairman of the House Appropriations Committee has decided to retire. A powerful state senator is in the crosshairs. The heads of the University of Texas may be involved. And the media, both in Texas and nationally, is largely silent. The Embassy of Sudan has release an official public statement that torturing and executing a woman for her Christian faith isn’t “violating human rights.” Earlier this month a Sudanese judge sentenced Meriam Ibrahim to be flogged and executed for her Christian faith. She is currently on death row and just gave birth to an American girl. Her son, an American toddler, is also imprisoned with her. The Sudanese government’s statement acknowledging the case alleges that the media and world leaders “have mistakenly accused the government of Sudan of violating human rights.” Its outlandish attempt to deflect, defend, and distort reality is mindboggling. Sudan literally spends more time contesting the spelling of her name than dealing with the cold, harsh reality of its degradation of human rights. U.S. Sen. Ted Cruz, traveling in Israel and Eastern Europe to meet foreign leaders, said Wednesday that the U.S. should review a planned Exxon Mobil Corp. oil exploration project with the Russian state-controlled company Rosneft as the West looks for ways to apply more pressure over the Ukraine crisis. The Texas Republican’s remarks underscored the political difficulties surrounding calls in the U.S. and Europe for sanctions against Russia that could have economic consequences back home. The United States would attain broad economic benefits, including lower gasoline prices and new jobs, by ending a 39-year-old ban on exporting crude, according to an analysis released Thursday. The assessment, conducted by IHS for more than a dozen oil companies, is the first of several expected reports examining the issue, as domestic producers implore Obama administration officials to end the 1970s-era restrictions they say threaten to throttle U.S. crude production. It also is aimed at skeptical policymakers in the nation’s capital who are concerned consumers would be hurt by lifting the ban on selling U.S. crude overseas and are wary of industry’s claims that changes are urgently needed to sustain record-setting domestic oil production. Most notably, Energy Secretary Ernest Moniz told industry leaders in March that they had not “clearly and concisely” stated the case for exports. A preliminary report released Wednesday found “serious conditions” at the Phoenix Veterans Affairs facility, including hundreds of veterans who were never placed on an official wait list and faulty scheduling practices that meant some veterans would never see a doctor. The Department of Homeland Security (DHS) is refusing to answer Congress’ questions about the existence of a secret terrorist “hands off” list that is said to have permitted individuals with terrorist ties easy entrance into the United States. The existence of the hands-off list was first publicized earlier this month by Sen. Chuck Grassley (R., Iowa), who released a cache of internal DHS emails detailing the list’s existence and a discussion about permitting an alleged member of the Muslim Brotherhood to enter the United States. The revelation that individuals tied to terrorists were given special treatment drew outrage among lawmakers and led U.S. Customs and Border Patrol (CBP), one of the agencies involved with the list, to hold a closed-door briefing with Grassley’s staff last week, according to a senior Senate source with knowledge of the meeting. Indian court asked to rule on whether Hindu guru dead or meditating They put him in a freezer a few months ago pending a ruling so if he was not dead then he surely is now. If Republicans are trying to make the midterms a referendum on the president, Democratic senators are doubling down on issues specific to their home states. Democrats have been trying to govern against the will of the people. More people despise Obamacare than love it. On energy the Democrats have their artificial scarcity agenda that is impeding the development of resources on federal controlled sites. If they would get out of the way the US would be creating thousands of jobs and creating a trade surplus. In fact if it were not for development of energy on private sites GDP in this country would be substantially lower and the jobs situation would be much more dire. Democrats are also stuck defending a president who is blocking the Keystone XL pipeline to placate the carbon phobic wing of his party, even though they are in the minority in the country. But the propaganda and lunacy go even deeper. Jacqueline Battalora, professor of sociology and criminal justice at Saint Xavier University, informed conference participants that "white people did not exist before 1681. Again, white people did not exist on planet earth until 1681." That's truly incredible. If Professor Battalora is correct, how are we to identify William Shakespeare (1564), Sir Isaac Newton (1642), John Locke (1632), Leonardo da Vinci (1452) and especially dear Plato (428 B.C.)? Were these men people of color, or did they not exist? ... The whole thing is worth reading. Walter Williams shows just how ridiculous this racist movement is. It is being pushed by self loathing white liberals. Heritage Foundation Chief Economist Stephen Moore noted this week that, without the jobs that have been created in the oil and gas industry, the United States would have produced no net jobs over the last five years. ... If the Democrats would get out of the way and stop their policy of artificial scarcity of oil and gas resources, this energy boom would be nationwide. U.S. sales of liquefied petroleum gas (LPG) to Latin America have quintupled since 2007, edging out more expensive exports from countries such as Saudi Arabia and Algeria, according to official data and traders. With imported volumes surging fast and no domestic projects expected to open soon to produce cooking gas, Latin America's financial outlays for LPG, which governments subsidize for consumers, are expected to grow. A lack of industrial capacity and stagnant natural gas production in Latin America means there is too little LPG to satisfy voracious demand, while the shale boom in the United States has created a growing surplus. "The U.S. is now Latin America's natural supplier of LPG. Venezuela used to supply several Central American and Caribbean countries, but that's not happening anymore," said an industry consultant who declined to be identified because they advise LPG importers. Stoning and other forms of “honor killing” may be illegal but public opinion still approves of them. That people in Pakistan approve of this murder of relatives is even sicker. Those responsible for these deaths need to face justice if this sickness is to stop. Those who preach this version of Shari'a also need to face justices as accessories to murder. Dozens of demonstrators stormed the presidential headquarters in Georgia's Russian-backed breakaway province of Abkhazia on Tuesday after a protest against alleged corruption and misrule, Russian news agency Interfax reported. Several thousand opposition supporters had gathered in the capital of the Black Sea coastal region to vent anger at the government and demand reforms, Interfax said. It said some opposition representatives later held talks with Abkhazia's president, Alexander Ankvab, in his office but that others broke windows and doors and about 30 entered the building through a shattered window. Abkhazia broke from Georgian rule in a 1992-1993 war after the collapse of the Soviet Union. Moscow recognized it as an independent state after Russia fought a five-day war with Georgia in 2008, and at the same time strengthened control over the region. Only a handful of other nations recognize Abkhazia as an independent state. New Yorker Votes 14 Times After Death He was not the only dead voter in his county. It is reasonable to believe that all the dead voters were Democrats, since they are the only ones who oppose requiring Voter ID. The clear winner in the 2014 Republican Primary and runoff election is the grassroots effort spawned by the Tea Party, no matter what candidates win. Every candidate on the ballot has shaped their campaign around illustrating their support of the Tea Party principles of limited government, reducing taxes and fiscal responsibility. The other big winner in this Primary election is Senator Ted Cruz (R-TX). His election in 2012 ignited Tea Party activists across Texas who have worked for the past two years to find viable candidates and support them through this long election process. Nearly every candidate on the ballot has tried to find some way of connecting themselves to Ted Cruz and the Tea Party movement by using quotes from or pictures with the prominent junior senator from Texas. Vladimir Putin, with the aid of his vast propaganda machinery, has convinced many Russians that the interim government in Ukraine is expressly Nazi and fascist. And while there were some neo-Nazi goons among the protesters who brought down the corrupt government of Victor Yanukovich, and there are definitely ultranationalists among the coalition resisting Moscow, it’s simply a transparent lie that the current government is fascist. That hasn’t stopped some left-wing writers and crackpots in the West from buying the Russian claim that the United States is in cahoots with a “fascist junta” in Ukraine. When the government proposes new limits on power plant greenhouse gas emissions next week, the proposal is likely to give a big boost to natural gas at the expense of dirtier-burning coal. But other non-emitting electricity sources — including wind and solar — also stand to benefit from the requirements set to be announced June 2. And depending on how the Environmental Protection Agency writes the new rules, states such as Texas and California that have embraced renewable power or boosted their gas use may not have far to go to meet the mandates. State Sen. Dan Patrick, riding a wave of tea-party populism from relative obscurity as a Houston radio talk-show host to statewide prominence in just eight years, defeated incumbent David Dewhurst Tuesday to win the Republican nomination to become Texas' next lieutenant governor. The Associated Press declared Patrick the winner just after 8 p.m.
Patrick easily outpaced Dewhurst by about the margin hinted at in pre-election polls last week. The dramatic win, which came two months after Dewhurst came in a distant second in the March GOP primary, signaled a likely end to the career of Texas' No. 2 elected official, a multi-millionaire Houston energy businessman once seen as a likely choice to be governor. Pregnant Pakistani woman stoned to death by family A pregnant woman was stoned to death Tuesday by her own family outside a courthouse in the Pakistani city of Lahore for marrying the man she loved. Marrying for love evidently is not permitted by this family and it carries a cruel and unusual death sentence. It is one of the things wrong with the way some practice Islam. Staying physical throughout all stages of life is essential to mental and physical health. A recent study conducted by researchers from the University of Florida (UF) shows that routine physical activity helps older individuals maintain mobility while simultaneously reducing their risk of physical disability. "The very purpose of the study is to provide definitive evidence that physical activity can truly improve the independence of older adults," said principal investigator Marco Pahor, Ph.D., director of the UF's Institute on Aging reported in the press release. For the study, researchers examined 1,635 participants between the ages of 70 and 89. The team randomly separated the individuals into two separate groups that were followed for an average of 2.6 years each, from February 2010 to December 2013. According to our Energy Information Administration, Europe sits on reserves equaling 639 trillion cubic feet of gas — roughly equal to half of Russia’s reserves (the world’s largest) and more than enough to make Europe independent of Putin and Gazprom. But that tapping those reserves means embracing fracking, the technology that has revolutionized the US energy industry by unlocking vast amounts of shale gas and oil. Like environmentalists here, Europe’s greens have made fracking a dirty word — and the European fanatics have more political clout. For example, Exxon Mobil began fracking to harvest natural gas in Germany in 2008 — but had to stop when the government issued a moratorium. France has banned fracking outright. The United Kingdom has proven gas reserves of 200 trillion cubic feet in Lancashire alone — but with even the Cameron government pushing, it may be years before permits to drill get granted.